Credit to Jeni in her blog In color order for these awesome tips. 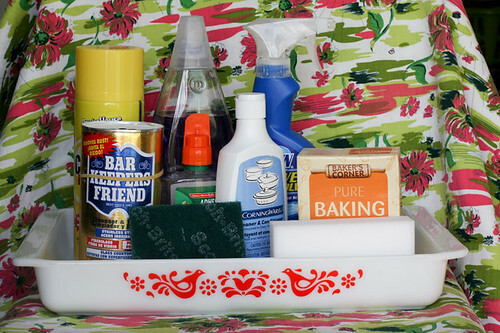 Today's Pyrex post is about cleaning! 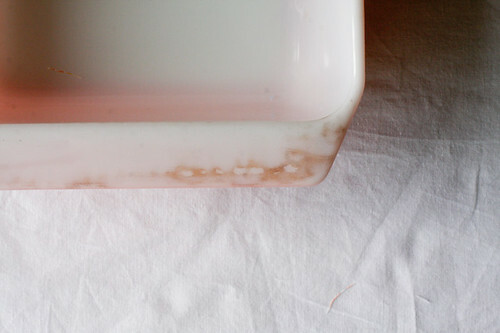 We will identify the various common stains on Pyrex and the many different cleaning products that can be used on them! First we'll simply identify some useful cleaning tools that you may want to equip yourself with to tackle dirty Pyrex! Liquid dish soap, Mr. Clean Magic Eraser, Baking Soda, Bar Keeper's Friend, Corningware Cleaner, Oven Cleaner, Dawn Powder Dissolver, Goo-gone, and Scotch-brite pads. I have added notes to all of these images to better show the stains. To view them you will need to click on the image and be redirected to flickr. 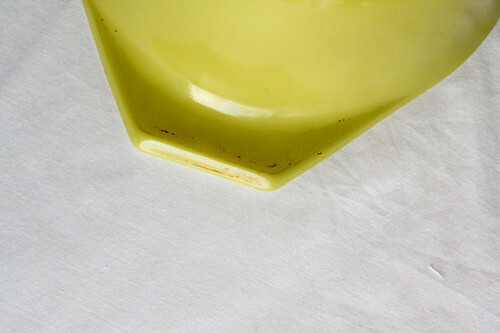 First and arguably the most common stain on Pyrex is a yellowish stain as seen in the backstamp of this bowl. This will sometimes just be dirt, and can be removed with a little soapy water. Generally however, it needs to be removed with a Magic Eraser. Wet the eraser and the piece. Do a little scrubbing and it should be gone! One of the other very common stains on Pyrex is baked on grease. It usually appears in dots like this and is also usually found on the handles. A little scrubbing with a Magic Eraser can help, but often is not enough. I usually attack these stains by soaking the piece in hot water + baking soda. Soak for an hour or two depending on how much grease there is. Then use a Scotch-brite pad and a little soap to scrub away the grease. I have found the Corningware Cleaner and Dawn Powder Dissolver are helpful with these stains as well. Sometimes the stain will get into the grooves and can be scraped out with a toothpick or pin. One of the hardest stains to remove are these gray streaky stains. They are metal marks. The best product to remove them is Bar Keeper's Friend and Corningwear Cleaner. Generally, Bar Keeper's Friend will remove them completely, but will also remove the shine, which you don't want. I only use Bar Keeper's friend on white pieces and only leave it on for a few seconds before scrubbing and rinsing it off. Sprinkle it on your sponge or scrubber and not directly on the Pyrex. Be VERY careful while using it because it is pretty abrasive and can damage pieces. I use this as a very last resort. The Corningwear Cleaner can remove these stains but will also remove a bit of shine although not nearly as much as the Bar Keeper's Friend. Just be careful when using either product! The only stain that has completely stumped me so far are these pesky stains. I am still a little unsure what the stain is, but I have only seen it on baking dishes so far, so I must conclude that it is some kind of oven stain. I have been told that oven cleaner can be used on these but I have not had luck with that yet. The oven cleaner I have was purchased at the dollar store, so that might be why I haven't had any luck! A woman at a flea market last weekend suggested I try the cleaner for glass stovetops but I have yet to try this out! Another thing to look out for that is not a stain is scratches in the color. When shopping, a simple way to check for this is to hold a piece up to the light. The scratches will let light through and you can easily see them. These cannot be removed in any way. Goo-gone and rubbing alcohol can be helpful when getting off pesky price stickers! 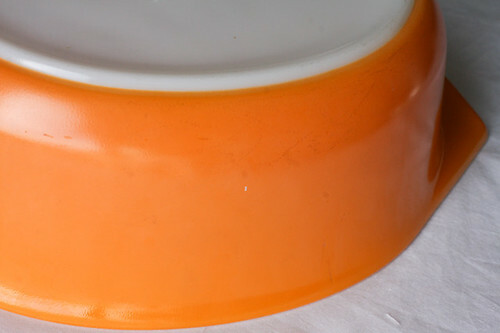 Another thing you may run into while shopping for pieces is Pyrex that has had it's lid taped together with packing tape. This is especially annoying for collectors as it can take off the pattern if you aren't careful! I found this out the hard way! In order to safely remove the tape I suggest (using rubber gloves) to pull up a tiny bit of the tape, and then let veryhot water run on it and slowly pull it off. The water seeps under the tape quite well and allows it to come off much easier. This method has worked very well for me since my original debacle with packing tape! One more thing to mention is fading! Color fading and loss of shine in general cannot be fixed, although some have had luck in restoring shine using oils. I however have not! 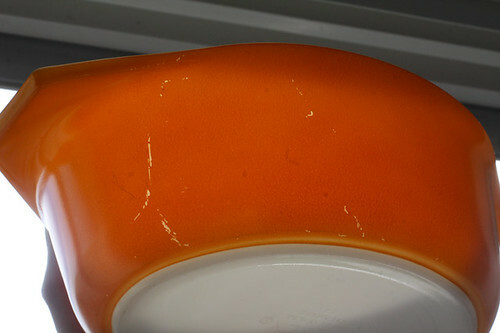 If a piece is faded from age or dishwasher use, there is pretty much nothing that you can do! As you are out thrifting and collect more pieces, you will learn how to recognize stains and know what you can get off and what you can't. If anyone has any other tips or tricks on cleaning Pyrex please do share in the comments and I'll add them to this post! Hope this was helpful! 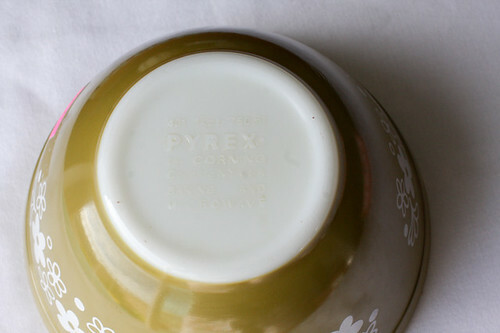 As always, click over to the Pyrex Love website for lots of Pyrex information! Next week's post will be about general care!